18.3.10.100.B. Requirements for Construction of all Buildings and Decks. b. 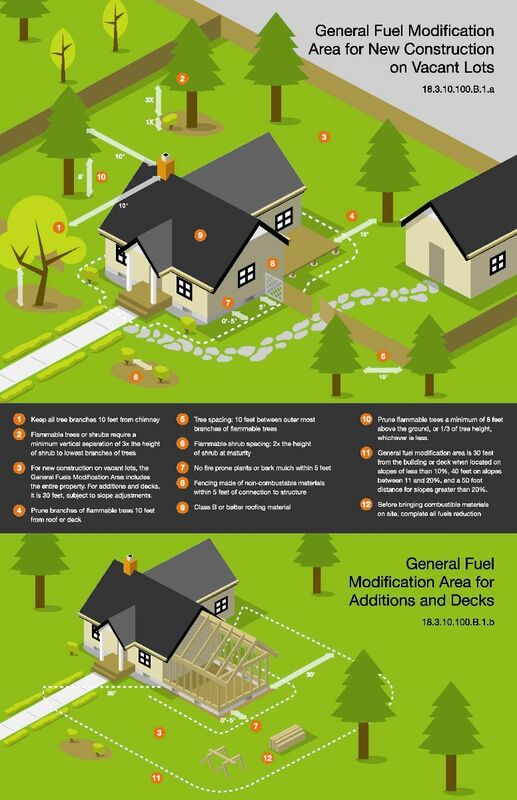 Decks, additions to existing buildings, and detached accessory structures which increase lot coverage by 200 square feet or greater shall have a General Fuel Modification Area extending 30 feet from the furthest extent of the addition, deck, or accessory structure, or to the property line, whichever is less. a. All standing dead and dying vegetation shall be removed from the property, except when considered ecologically beneficial. b. Newly planted vegetation within 30 feet of any building or deck shall not include species listed on the City's Prohibited Flammable Plant List. This setback distance shall be increased by ten feet for each ten percent increase in the average slope of the property over ten percent. c. Within five feet of a new building, addition, or deck, existing vegetation listed on the City's Prohibited Flammable Plant List shall be removed, with the exceptions of significant trees as defined in part 18.6.
i. Combustible materials may be permitted within five feet of a structure when approved by the Staff Advisor in consultation with the Fire Code Official, has determined the portion of the structure adjoining the combustible material is constructed with ignition resistant building materials sufficient to reduce the spread of fire from the combustible materials. i. Ten (10) feet horizontal clearance from a chimney outlet. At no time shall tree crowns or limbs extend into the vertical plane of a chimney outlet. ii. Ten (10) feet above the roof of a new building, or addition. iii. Ten (10) feet from the furthest extension of a new building, or addition or deck. iv. In circumstances where pruning a tree to meet the clearance from structures requirements of 18.3.10.100.B.2.d. i-iii, would compromise the health and survival of existing trees, the Staff Advisor may modify those requirements, but at a minimum the trees shall be pruned to maintain a ground clearance consistent with 18.3.10.100.B.2.i. f. Canopy spacing of the outermost limbs of trees on the City's Prohibited Flammable Plant List shall be separated by at least ten (10) feet at mature size. i. Groups of trees in immediate proximity to each other may be considered as one tree canopy when approved by the Staff Advisor in consultation with the Fire Code Official. ii. Canopy spacing requirements do not apply to significant trees, as defined in part 18.6, or trees that are not listed on the City's Prohibited Flammable Plant List. i. 10 feet horizontal clearance from a chimney outlet. At no time shall tree crowns or limbs extend into the vertical plane of a chimney outlet. ii. Tree limbs shall be pruned to ensure they do not touch any part of a structure including but not limited to roofs, eaves, and decks. h. Existing trees which are identified on the City's Prohibited Flammable Plant List shall be pruned to provide a ground clearance of a minimum eight feet above the ground, or 1/3 of the tree height, whichever is less. i. Five (5) feet clearance from the furthest extension of a new building, addition or deck. ii. Separation from other listed flammable shrubs within the General Fuel Modification Area shall be a minimum of two times the shrub's height at maturity. ii. Separated from other listed flammable shrubs by a minimum of two times the shrub's height at maturity. iii. Located outside of the drip line of a tree which is listed on the City's Prohibited Flammable Plant List. k. The vertical clearance between the top of understory vegetation within the drip line of a tree, and the lowest tree limbs shall be at least three times the height of vegetation where either the tree or vegetation is listed on the City's Prohibited Flammable Plant List. l. Where necessary for erosion control, slope stability, riparian and wetland preservation and enhancement, performing functions considered beneficial in water resource protection, or aesthetic purposes, existing vegetation may be allowed to be retained consistent with an approved Fire Prevention and Control Plan, or upon written approval of the Staff Advisor in consultation with the Fire Code Official. m. Fuel Modification in areas which are also classified as Hillside Lands or Water Resource Protection Zones, shall be included in the erosion control measures outlined in section 18.3.10.090 Development Standards for Hillside Lands and Management Plan for Water Resource Protection Zones in 18.3.11.110.
n. The General Fuel Modification Area standards outlined in 18.3.10.100.B.2 may be reduced or waived when approved by the Staff Advisor in consultation with the Fire Code Official, provided it is demonstrated that the fire risk has been reasonably reduced such as in cases where ignition resistant materials and construction methods, or vegetation type and separation, function to enhance the structure's protection from exterior wildfire exposure. 3. Roofing. Where 50%or more of a structure's roof area is replaced within a five year period, the roof covering shall be constructed or re-roofed with a Class B or better roof covering. 4. Fencing. Where fencing is attached to a building or deck, the fencing shall be made of non-combustible materials within five feet of the connection to the structure in compliance with the requirements in AMC18.4.4.060.